Last week, I talked about how a movie must have a small enough story that it can fit within two hours and still leave enough time for character growth. Obviously, one way to keep your story lean is to strip away extraneous material: start every scene late, end it early, and avoid meandering digressions. But, paradoxically, in order to be lean, you also have to be dense: you have to pack every moment of every scene with as many metaphors as possible. Let’s look at one little throw-away scene from Breaking Away that is extremely dense with metaphorical meaning. 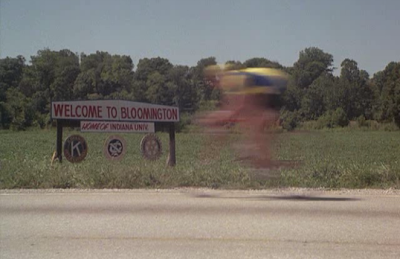 Dave is a directionless kid in the suburbs of Bloomington, Indiana who resents the IU college kids, and wants to prove he can be better than them by emulating Italian bicycle racers. That’s his false goal. But by the end of the movie, he will realize that he must overcome his resentment and enroll at IU himself. That’s his unsuspected true goal. This one little scene metaphorically encapsulates both goals. Dave gets a magazine saying that the Italian bicycle team sponsored by Cinzano vermouth is coming to race in Bloomington. He goes out to practice so that he’ll be ready. He bicycles out to the highway, where he pulls up behind a tractor-trailer, which happens to be hauling Cinzano. Dave keeps up even as fast as 50 mph. The shooting and editing switch from bucolic to tense, making it into a real race. But a cop car pulls the trucker over and gives him a ticket. Dave whips around the regretful trucker with a big smile on his face, and passes a sign that says he’s now entering Bloomington. Every aspect of this little scene is packed with ironic meaning. First, it drives home his false goal: Dave doesn’t tell anyone in this scene that he’s obsessed with Italy, but he doesn’t have to: He’s dressed himself as an Italian racer, he’s cheering himself on using his little bit of self-taught Italian, the director even scores the scene to an Italian symphony... And the race against the Cinzano truck obviously foreshadows Dave’s upcoming race against Team Cinzano. But the scene doesn’t stop there. It also foreshadows Dave’s hidden true goal. In his mind, he’s in Italy, but he doesn’t even notice that he is actually racing toward the University the whole time, his true destination. He also doesn’t notice that, by projecting his fantasy onto this trucker, he is actually screwing the trucker over, leaving him to pay a ticket for Dave’s stunt. This foreshadows the subplot in which Dave courts a college girl (the “enemy”) by pretending to be an Italian, not realizing how much it will hurt her feelings when his deception is revealed. Every year, the Oscars remind us how many artisans it takes to craft every second of film. If those artisans are short-sighted, they will practice their art in a vacuum, suiting their work merely to their own aesthetic sense. But if they really care, they will constantly consult the script to look for ways to magnify the themes of the movie. In this scene, the costume, the score, the location, the art direction, the editing, and the cinematography all act as metaphors that multiply the message—all without a single exchange of dialogue. Cramming so much meaning into a little throw-away scene takes a huge weight off of the actual dialogue scenes. The more you can show to your audience in non-verbal ways, the less you’ll need to tell them through dialogue, and that leaves you with more space to let your story breathe.